A rounded shrub with dark green leaves, turning red in autumn. 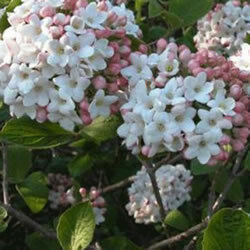 Clusters of fragrant, white flowers open from pink buds in late spring. Height: 3m. Spread: 3m. Flower colour: White. Flowers from April to May. Deciduous. Foliage colour: Green. Hardy.